1. What material(s) are Mexican masks made from. Are they made from plaster, paper mache…? Answer—The majority of traditional Mexican masks are hand carved from wood. Certain dances have usually used masks of leather or hide, or masks with a leather foundation that is enhanced by wooden or plaster features. There are just a few places in Mexico where the masks are made entirely from plaster, and even fewer that use masks formed from metal window screening, from recycled tin cans, or from layers of cloth that have been pressed together with glue on a ceramic form. Paper mache masks, made by pressing moist newspaper over a ceramic mold, have long been widely available as an inexpensive alternative, for instance to be worn during Carnaval, or Mardi Gras, but these have never been routinely used in other traditional dances. In recent years the most common inexpensive alternative masks have been made of plastic or rubber; those masks are exactly the same as those used by North American children at Halloween. 2. What do Mexican masks cost? Answer—One must begin to answer this question with another question—”Where are these masks being purchased?” If one travels to rural Mexico, hires a guide, and searches diligently, it may be possible to buy a wonderful mask for $50 or $100. New undanced masks of great quality and charm may cost only $25. But of course the true cost of that mask would include the costs generated by the trip. Therefore, Mexican masks usually cost more in the United States. Undanced but authentic masks that were made by traditional carvers can be found for modest prices—$50 to several hundred dollars. Excellent older masks range in price, from hundreds to thousands of dollars, based on rarity and quality. But because there is not widespread awareness of what constitutes quality, bargains are frequently to be found, and this will be a recurring subject in my posts. 3. Why are some of the masks so scary or grotesque? Answer—Although this may initially seem like a naive question, it leads one to discover the most interesting answers. Perhaps this will be more obvious if I restate the question in a less specific form—”Are masks what they seem, or can appearances be deceiving?” Future posts will address this question in detail, but I will provide a brief answer here. Mexican Indians have freely borrowed characters and symbols from European sources, particularly from European Christianity. However, these borrowed words and faces frequently no longer carry their old meanings. Instead, they have been co-opted to cloak the inclusion of Indian meanings and values. The more exaggerated and vivid the borrowings, the more effective the camouflage. The favorite Christian character for such purposes is Satan, the devil. 4. That mask has a beautiful face, does it represent Christ? 5. Why would anyone be interested in Mexican Dance masks? Answer—There are many reasons to be interested in Mexican masks, although these are seldom apparent to a person who is encountering them for the first time. It seems that many people are initially attracted to Mexican masks of animals, either because the animal portrayed by the mask is noble, for instance a jaguar, or endearing, such as a dog or a monkey. With further experience, one becomes aware that there is a subgroup of Mexican dance masks that are somehow humorous. Maybe they are worn by clown figures, or by alleged negative figures, such as “devils,” or by figures with idealized and noble faces, but as already noted, not all characters are what they seem. Some masks have a jaunty, ribald, or insanely antisocial appearance that makes them seem immediately funny. As one learns more, it often emerges that some dance characters are complex, meaning that they operate at more than one level. There are obvious levels, such as combat, occupational activities (hunting, fishing, or farming, for example), or genuine slapstick, but in addition there are hidden levels. These may reflect former or persistent social conflict; there, it may be the job of the farmer, the clown, the devil, or the “barbarian” to articulate complaints about social injustice, but covertly, indirectly, maybe even by imitating the bad behavior of oppressive overlords in a manner that articulates a devastating critique. To restate this point in a completely different way, Mexican masked dances are frequently performed by Indians, who bring at least three aspects with them to their performance—the covert retention of important preconquest values and practices, a sense of identity that is based on these values, and a desire to protect and support a sacred world. Yet, over time such concerns have evolved. Mask makers have become artists and sculptors, often in response to their training to create religious sculptures. In my experience, the more that one learns about these things, the more interesting, beautiful, and funny they become. 6. Why isn’t everyone interested in Mexican dance masks? 7.What are “made for sale” and “decorative” masks? 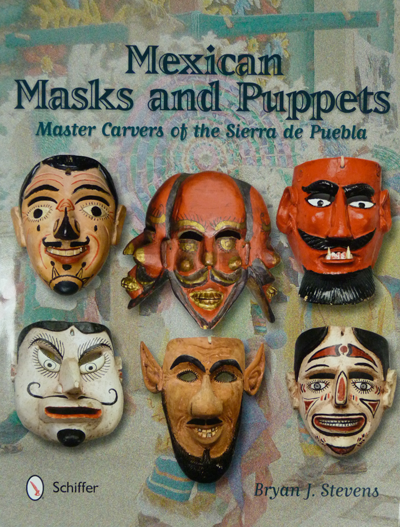 Answer—Long ago, it is likely that carvers made dance masks on demand, in preparation for some upcoming performance. It has only been in the last fifty years or so that mask makers have frequently taken advantage of “down time,” such as slow periods in the agricultural cycle, to make a mask or masks in advance of any identified need, on the assumption that a buyer will eventually appear. These masks would be carved to a performance standard, so that either a dancer or a knowledgeable collector would find them satisfactory. These are called “made for sale masks.” In recent decades, these masks have evolved. Some are carved more carefully then ever, with the hope of appealing to discerning dancers and collectors, others are carved more carelessly and generically, aiming at a lower price point, and a third group have been embellished by fantastic design details, invented provenance (false character names, false dances, and attributed to false towns), and artificial treatments to mimic the effects of age and wear. The polite term for these latter masks is “decorative, while the impolite” term is “fake.” Were they to be presented with honest descriptions and intact finishes, they would fall under the label of folk art. 8. The wealthy collect modern art and related indigenous arts because they perceive these to be appreciating assets, investments. Are Mexican masks a good investment? Answer—The short answer is “maybe.” I will briefly explain. First, good Mexican dance masks are seriously under-priced, compared to many other categories of folk art, and bargains are not difficult to find. Were there more widespread understanding of what constitutes quality in Mexican masks, versus the lack thereof, I suspect that collectors would value good masks more highly and that prices might even rise. In my view, Mexican masks are sufficiently artistic, interesting, magnificent, or entertaining that they are well worth having, whether they increase in monetary value or even if they do not. On the other hand, an initial generation of wealthy would be collectors of Mexican masks were discouraged by an infusion of spuriously labeled decorative masks; after a flurry of buying, these collectors felt duped, and many disposed of these holdings. Of those who turned away from Mexican dance masks, few have returned. There were others who decided that they liked their decorative masks enough to keep them. One of the goals of this blog is to provide collectors with information so that they can buy either authentic or decorative masks, whatever they wish, but with their eyes wide open. 9. If a wooden mask shows signs of infestation by wood-boring insects, what should be done to limit the damage? Answer—First, here are the telltale signs of an active infestation. There will be small pinholes on either the outer face, the back, or both. If one taps the mask on a ceramic plate, fine sawdust will fall to the plate’s surface. This is the sign of an active infestation. If more granular material falls to the plate, this may be a sign of an old, inactive infestation. You might prefer to treat such a mask anyway, as a preventative measure. The most benign (least damaging or toxic) approach to the prevention or treatment of such an infestation is by placing the mask in a freezer for two weeks, removing it for two weeks, and then putting it back for two weeks more. If practical, you may want to put the mask in a plastic bag during this treatment to reduce the spread of sawdust. If two trips to the freezer prove inadequate, you may want to try longer stays, again separated by intervals outside of the freezer.